Make a great first impression on your guests and breathe new life into your home by having the experts at Dreamstyle Remodeling, America’s #1 remodeler, install beautiful new Pella doors. Pella’s wood doors offer exceptional beauty and warmth to any home. Protected by EnduraGuard®, these doors are designed to withstand the effects of moisture, decay, and mold and mildew. They can also resist termite damage. Made from our patented fiberglass composite called Duracast®, these easy-to-care-for doors are our strongest and most durable, and they resist the most extreme weather conditions. 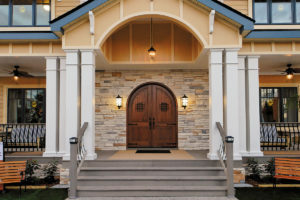 Pella’s unique vinyl formula has been performance-tested for incredible durability, color retention, and weathering, ensuring these doors are easy to maintain and will look new for years to come. Our line of Pella steel doors comes in a variety of prefinished stains and paints and provide superior protection from drafts and leaks. We understand that when you’re choosing a door, aesthetic appeal is wonderful, but protecting your loved ones and possessions is of the highest priority. That’s why all of our doors can be equipped with a multipoint locking system to provide added security against potential intruders. Plus, all of our doors meet ENERGY STAR® standards, which means they will minimize heat transfer and could potentially save you money on your heating and cooling costs. Contact Dreamstyle Remodeling today so we can send out a designer to your home to figure out exactly what you need, and get you on your way to enjoying a gorgeous new door.